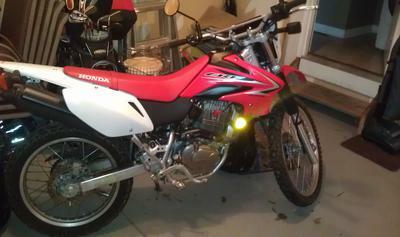 The 4 stroke 2009 Honda CRF230L Dual Sport for Sale has low mileage of just 2,282. This versatile bike is in excellent used condition (it looks new!) with an automatic start. If you have any questions regarding the Dual Sport motorcycle for sale or if you would like to make an appointment to see it in person you can call me and when you do mention that you found my ad on GoGoCycles Used Motorcycles for Sale . GoGoCycles would also encourage our friends and fans of this dirt bike to write a review of the 2009 Honda CRF230L Dual Sport for Sale or share any thoughts and/or opinions to make potential buyers aware of any problems that are commonly associated with this used Honda motorcycle for sale or to highlight its positive features and help our visitors make informed decisions. The used dirt bike for sale is in Brownsville TX. The price I have on it, $3395, is a very good price and it probably will be gone fast so call me (no e-mail)9 five 6 - 3 seven1 -3seven00 before it's gone and don't forget to mention that you found this ad on GoGoCycle's Motorcycle Classifieds www.gogocycles.com using the comments forms located on this page.